A best man's speech is intended to be funny. It's meant to be humorous. But they are, too often, not at all funny and a bit dull. But a fiery best man's speech? However that's not the feedback from a best man's speech given by Will Cundall at a wedding reception in Tamworth last week. This was very much a quick fire best man's speech. A very fiery best man's speech. The best man had a script, or at least he had a page of notes. So it appears that he'd done some essential preparation beforehand. Unfortunately he'd also done some preparation in the bar at the Tamworth Castle Hotel beforehand. Because that's never a good idea for a wedding speech. I was a bit tipsy to be honest. He gave his speech. Albeit he went over the time budget...the result of the earlier drinks, I suspect. However it was his finishing technique that caught the attention of his fellow wedding guests. He finished his best man's speech and casually tossed his speech on to the top table. So casually in fact that he didn't notice he's thrown his speech on to a candle. A lit candle. You can guess the consequences. First smoke. And, second a fire. Fortunately the wedding's hoteltoastmaster, Phil Lowther, was on hand. Seizing the burning speech he exited the banqueting room at speed. After some moments he returned. Problem solved. The plucky best man thanked Mr Lowther before taking a round of applause from the wedding guests. That was generous. I picked it up thinking I could just blow it out and somebody just grabbed it off me and I think I just shrugged my shoulders and went back to my wine. I have to suggest that I'd prefer to have the toastmaster on my side than the best man. 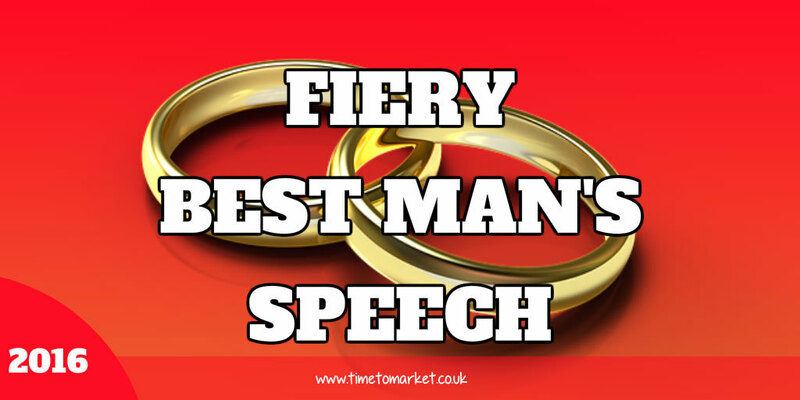 But a a fiery best man's speech at this Tamworth wedding speech has certainly proved memorable. Well done to the Bride and Groom and everyone! You can always discover plenty of public speaking tips, for weddings and every occasion. And with more than 100 top tips to choose from there's bound to be one just right for you. But when you are ready for some extra public speaking skills, maybe your own best man's speech, then some public speaking training might do the trick. Please don't hesitate to get in touch when the time is right.